I am dyeing Sea Silk. 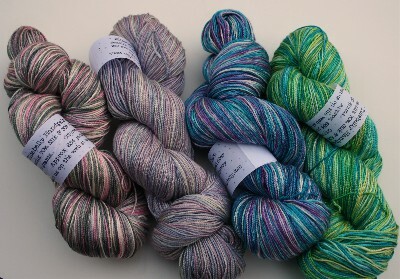 It is my dream yarn — part silk, part spun seaweed (Seacell). Its manufacturer claims it has antimicrobial and skin softening properties and I’m prepared to believe just about anything of this yarn. Although I have adapted some of the spring colorways for it, including Katie and Pellucidly, I’m also doing some colorways just for this yarn, including Sea Maiden and Mystery. (all pictured below). This yarn is beyond heaven. I’m going to be adding it and a Seacell/Merino sock yarn to the line up. Taxes — the bad part, but other than that, making lots of soup and pouring over the Disneyworld book with our two littlest ones to plan a trip there for part of spring break while the Judge takes our oldest to look at colleges. I’ve also got a round robin book from pocketful to work on this morning, and am letting the glaze dry on my own book for the new colors round robin so I can send it out either today or Tuesday. So, while there aren’t too many pictures this morning. There will be a lot more over the weekend! You want to take mine with you to Disney? LOL I’m currently selling them cheap — 10 days until the new baby, so the others are on my last nerve…..
i have skinny little arms. lol. sounds like you’ve got a full weekend. bet the kiddos are excited about disneyworld. Joyce, the sea silk is DELICIOUS! Oh, my. I won’t be able to resist…. This yarn is gorgeous! I wish I had skinny arms!